It’s Food Safety Week (16th-22nd of June) and this year the Food Standards Agency (FSA) wants us to stop washing raw chicken. I was invited to a special FSA event to find out why. 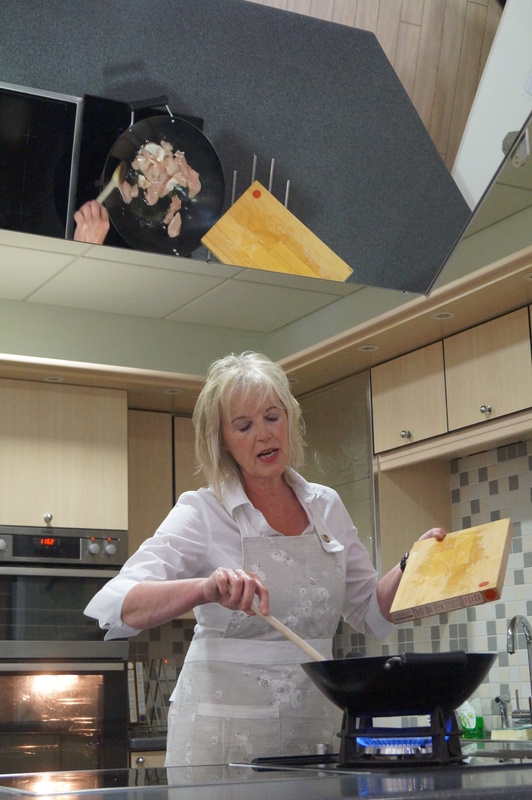 My initial reaction to the invitation was highly enthusiastic (I love a good cookery demo) and I was keen to find out more and share my findings here on my blog. But the more I thought about it the more I wrestled with the idea. I have professional experience in two fields; Cooking and Facilities Management (specifically cleaning), which I fear may make me a rather unpopular dinner party guest. Most people both cook and clean to some degree and have learned these skills over a number of years…so probably don’t like to hear that something they are doing is wrong. The difficulty I have is that I need to know the safest way of working and once I know it…well I can’t un-know it. If you’re cooking in my kitchen I will probably have one eye on what I’m doing and the other on making sure you’ve washed your hands, are using the correct colour coded chopping board/cleaning cloth/utensil for the task and if you so much as think about double dipping you’re out on your ear! Unfortunately for my friends and family I can be a little too eager to share gross food hygiene horror stories. But this particular campaign isn’t aimed at professional chefs but to anyone and everyone who cooks chicken, especially at home, and the FSA are keen to reach as many people as possible with the message “Don’t Wash Raw Chicken”. 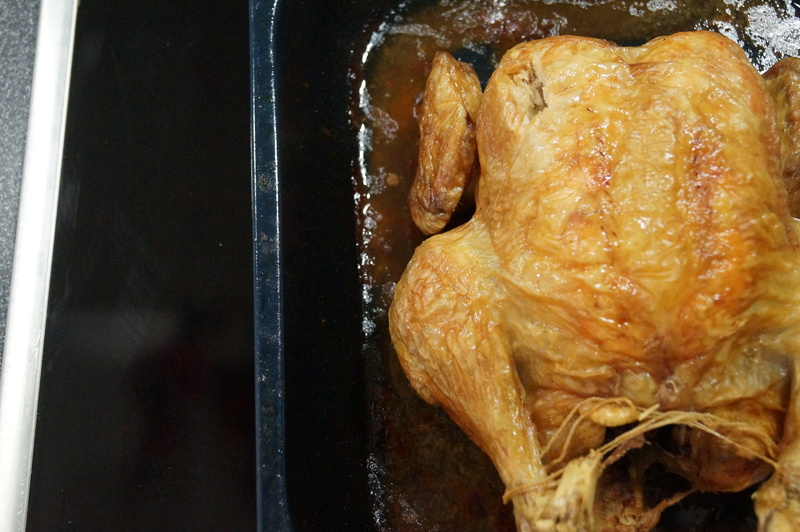 “The call comes as new figures released today show that 44% of people always wash chicken before cooking it – a practice that can spread campylobacter bacteria onto hands, work surfaces, clothing and cooking equipment through the splashing of water droplets. At the press event the speakers were Bob Martin from the FSA, Professor Sarah O’Brien from the Institute of Infection and Global Health at the University of Liverpool and Home Economist Sue Ashworth who demonstrated how to prepare a raw chicken for roasting and whipped up a quick Caesar Salad. Even though we’d spent the morning talking about food poisoning I still managed to scoff a load of Sue’s chicken salad. I knew that raw chicken was something to be dealt with carefully but I thought that was due to the risk of salmonella. 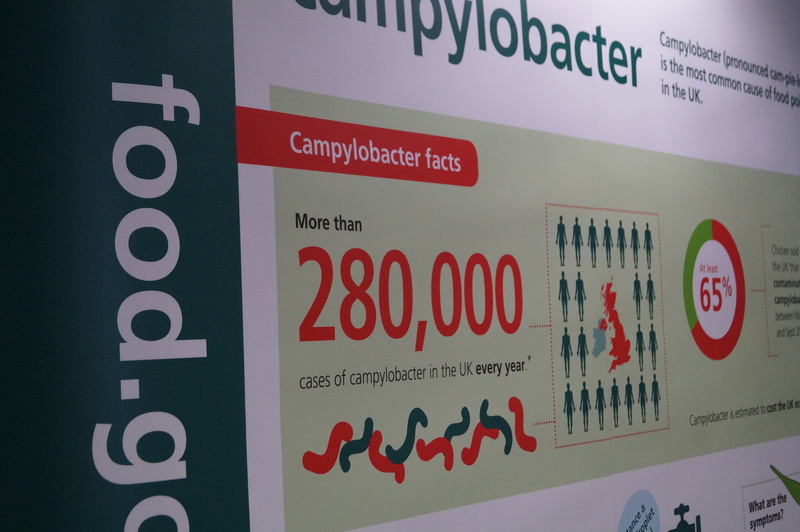 I was shocked to then discover the number of campylobacter cases far outweighs the instances of salmonella, e.coli and listeria put together! The facts kept getting scarier – the amount of organisms you need to consume to become infected is tiny and if you’re unlucky the effects can be horrendous. BUT this isn’t a public health scare. This isn’t like when BSE hit the headlines or Edwina Curie started flapping about eggs. 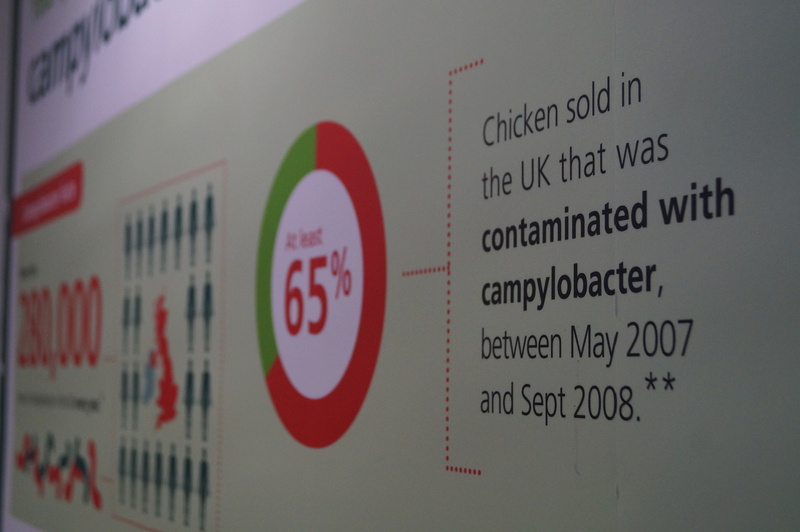 From what I could understand from the data presented; cases of camplyobacter have been steadily high for many years. The FSA seem genuinely committed to bringing these figures down and, as well as this campaign, they are talking to farmers, suppliers and major supermarkets to reduce the contamination at all stages. So, now you know! There’s loads more information, if you want to hear even more grizzly details on the FSA website. 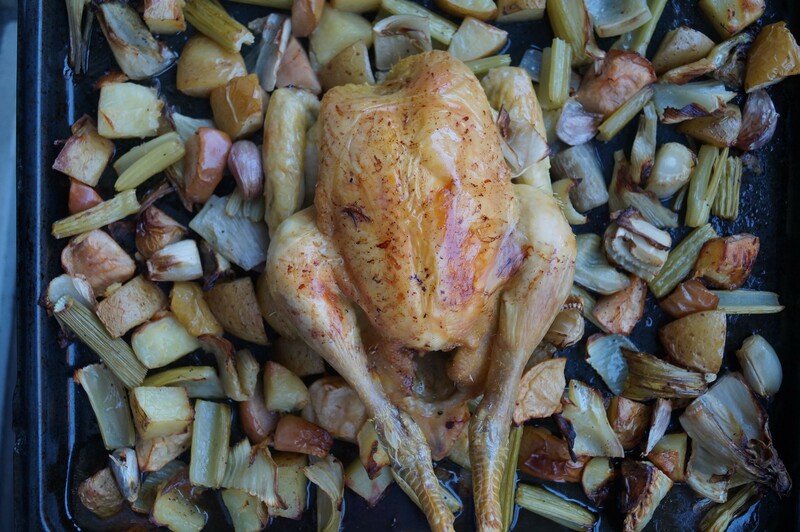 All you need to do is tip the raw chicken straight into the roasting tray or frying pan directly from the packet then wash your hands. The bacteria is mostly on the surface and the high heat of the oven or the pan will destroy the bacteria for you…no go tell your friends, preferably at a dinner party so that I’m not the only one! Now for the tasty bit. 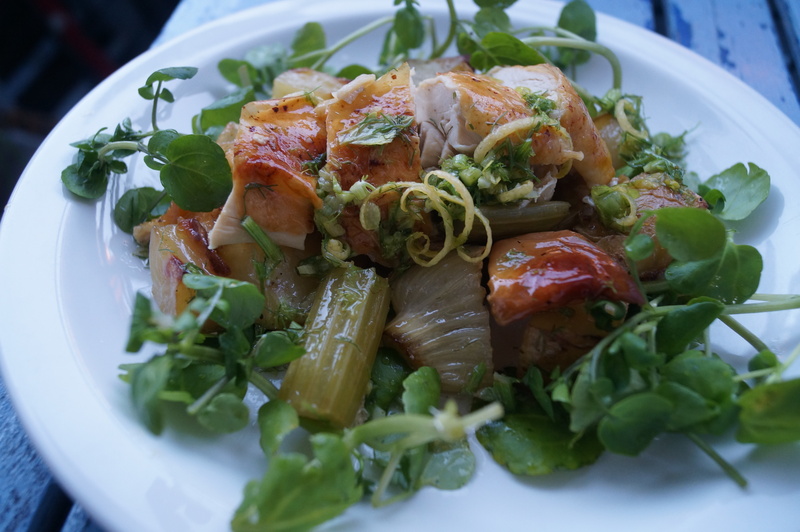 If all this talk of bacteria hasn’t put you off your dinner (and I really hope that it hasn’t) I’ve come up with a super simple alternative to a traditional Sunday Roast, perfect for a hot Sunday evening. Everything cooks together in one tray at the same time and there’s no sweating over a hot pan of gravy. 1. Preheat the oven to 190°C then drizzle the 3 tablespoons of olive oil over a large baking/roasting tray. 2. Pick the leaves off the celery stalks (if there are any) and the fronds from the fennel and set aside for using in the dressing. 3. 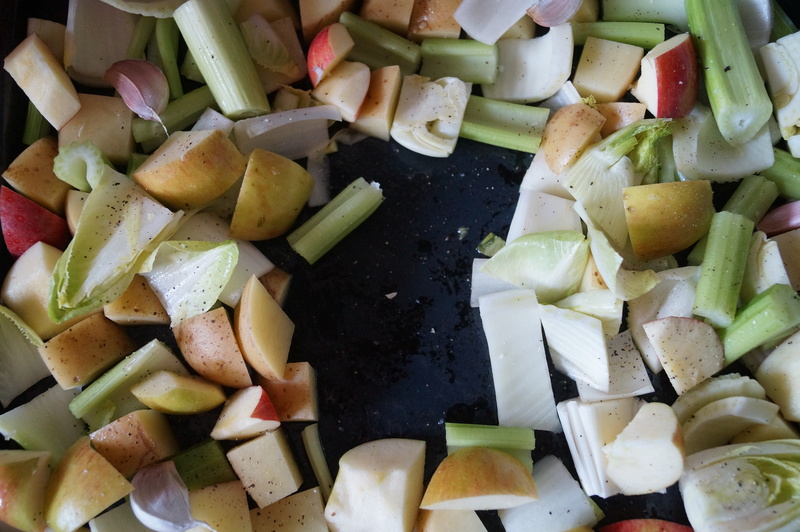 Wash and chop into large chunks the apple (discard the core and seeds), potato (no need to peel it), fennel, celery and chicory. Pile all these chopped ingredients and the garlic cloves into the roasting tray and toss in the oil. Season well with salt and black pepper then make a space in the centre of the tray for the chicken. 4. 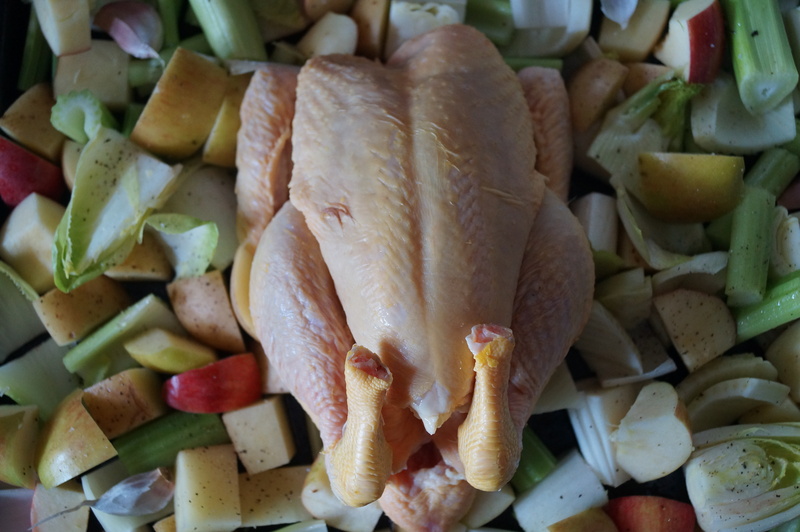 Remove and dispose of all the packaging from the chicken and place it in the centre of the roasting tray, no need to wash the chicken first. Wash your hands in hot soapy water. 5. Cover the whole tray in tin foil and roast in the preheated oven for 1 hour. 6. After an hour remove the foil and use a spoon to baste the chicken in the juices. Put the tray back in the oven for another 30 minutes. 7. 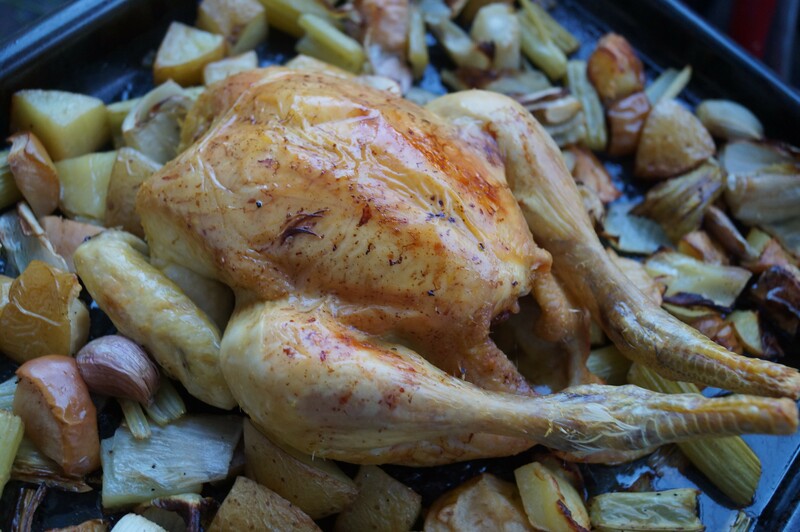 Check the chicken is cooked through by inserting a sharp knife or a skewer into the thickest part of the bird. If the juices run clear and the meat inside is opaque white all the way through then it’s ready. If not pop it back in the oven until completely done. 8. To make the dressing, finely chop the fennel fronds and celery leaves (reserved from earlier) and add to the zest and juice from one lemon. Whisk the mixture whilst you gradually add 2 dessertspoons of olive oil until well combined, it should also thicken slightly. Season with salt and pepper. 9. 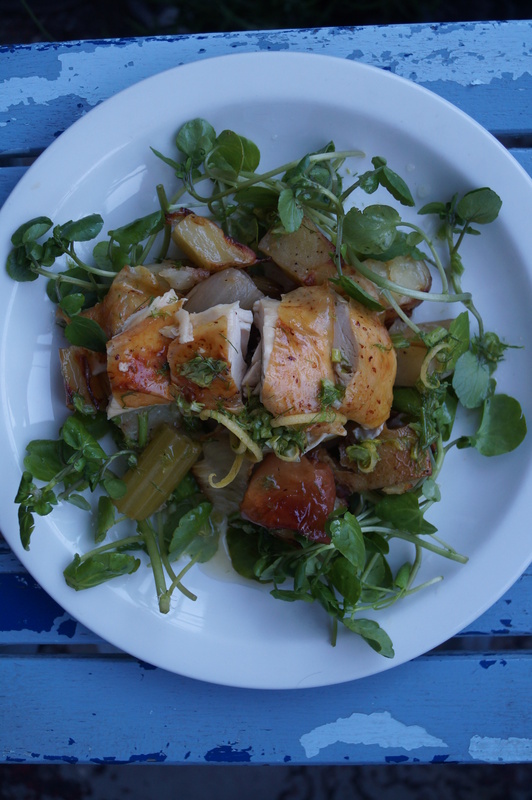 To serve, scatter some watercress leaves on each plate, pile the roasted fruit and vegetables on top then add pieces of roasted chicken. 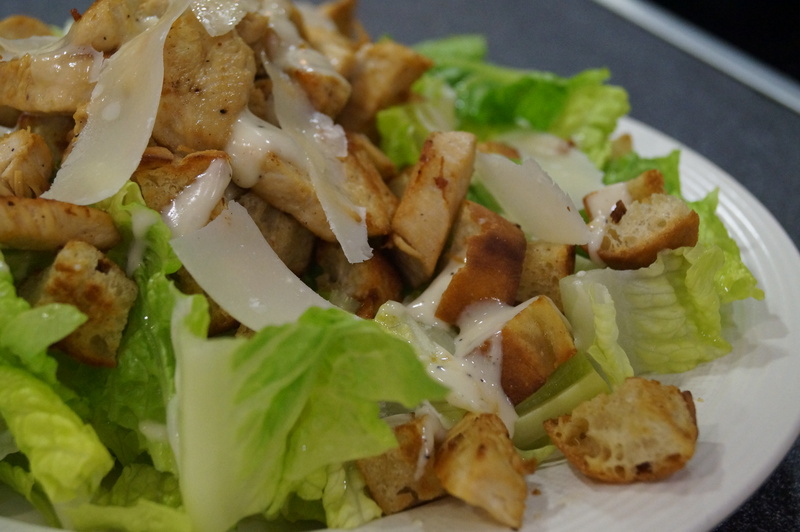 Drizzle everything with the lemon dressing and enjoy, preferably outside with a cold glass of white wine. What are your favourite chicken dishes? Did you wash raw chicken before the campaign started? Do you have any questions on cooking or ideas you want to share? Do get in touch I’d love to hear from you. 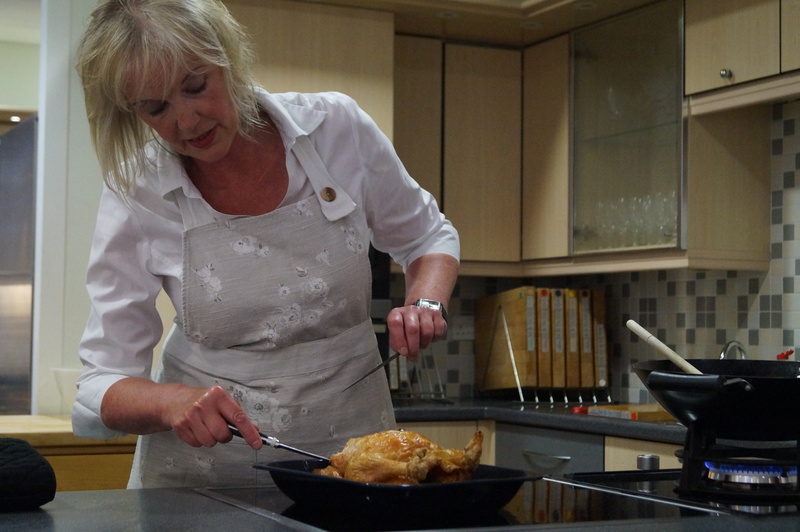 I’m on twitter as @miriamjsnice and you can throw all your kitchen queries at me using the hashtag #askmim. Alternatively say hi on Facebook or drop me a message via the Ask Mim! contact page.